Last week I had an absolutely incredible week at the 2011 MVP Summit. It was without a doubt the best business trip I have ever taken, bar none. What makes a conference great for me is not the sessions (although the sessions were awesome). For me it’s all about the attendees. Being able to interact every day for an entire week with PowerShell MVPs and Microsoft PowerShell team members was truly an incredible experience, something that you just don’t get day to day when you’re in the office dealing with so many distractions. While at the Summit I was meeting with some PowerShell MVPs, chatting about PowerGUI and PowerGUI Pro, and getting feedback on the two products (and taking a lot of notes!). Claus Nielsen, a fellow PowerShell MVP from Denmark was sharing some of his ideas with me and one feature he requested was scroll buttons for our tabbed document interface to allow you to scroll the view to other tabs. This is useful when you have many tabs open and you want to reorganize them or just scroll through the ones you have open. I get a lot of requests from the online community as well, some of which come via twitter. These don’t necessarily come from MVPs, although the one I’m about to use as an example does. Brian H. Madsen (@csharpzealot) tweeted about having issues when running PowerGUI and not realizing he was in the 32-bit version of the console on a 64-bit machine. Since you can run PowerGUI in 32-bit or 64-bit, elevated or not, it can be very useful to know how you opened it when you are working with the product. Other feedback comes in the form of direct email. One of our internal support reps was trying to figure out how to tell what encoding was used when saving a ps1 file because he was working with another product that didn’t seem to support that encoding. A lot of this feedback turns into enhancement requests for the core product, but there are also many ideas that turn into features I can quickly implement in an Add-on. All of the ideas I just mentioned in this post fall into the latter case, and between early mornings in my hotel room in Bellevue last week and a little time yesterday afternoon, I have finished implementing these (and more) in version 2.0 of the PowerGUI Script Editor Essentials Add-on. This Add-on is definitely one of my favorites, right up there with the Blue Console Add-on and the Script Signing Add-on. It comes with an indispensible feature set and whenever I install PowerGUI on a new system I immediately notice that it is missing and have to install it right away. You can now view and change the current file encoding by using the File | Encoding submenu. The menu items in this submenu will automatically save the current file and the checked item indicates the current encoding for the current file. You can now use scroll buttons to view all of the tabs that you have open. These scroll buttons are enabled by default, but you can always hide them or bring them back by using the View | Tab Scroll Buttons menu item. the current elevation status if you are running PowerGUI in an elevated process. I also fixed an issue preventing the shortcuts in this Add-on from working on some non-English operating systems, and I added icons that were missing for the Increase Indent and Decrease Indent menu items so that they show up as regular buttons if you add them to your toolbar. filtering for *.ps1xml, *.psc1, *.xml and *.txt files in the File | Open dialog. 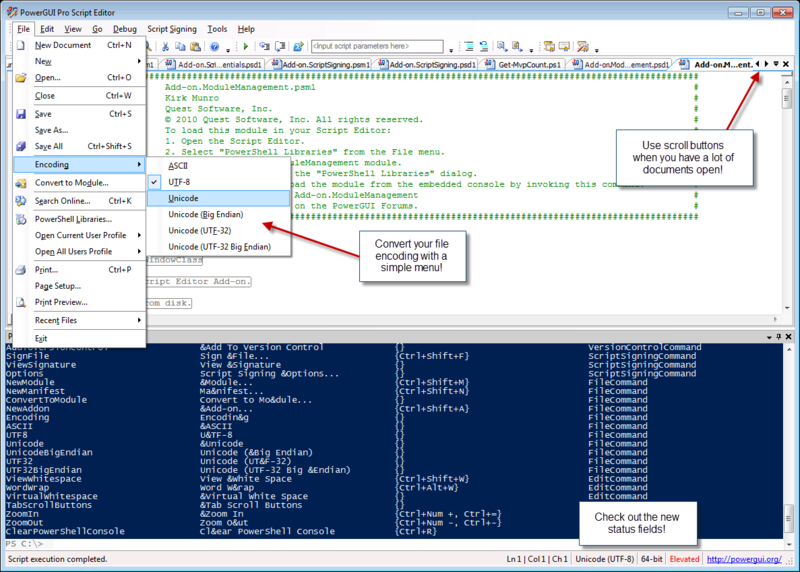 You can see screenshots showing these features on the Script Editor Essentials Add-on page. 2. In the dialog that appears, enter “Script Editor Essentials” into the text box and click on the Search button. 3. Once the Script Editor Essentials Add-on shows up in the results, click on the Add-on to select it and then click on the Install button to install the Add-on. This will download, unblock, install and load the Add-on in your Script Editor, and you’ll have these features in your favorite Script Editor in no time! If you’re not connected to the web, you can also install this manually by following the steps outlined on the Script Editor Essentials Add-on page on PowerGUI.org. Now that this update is released, what else do you think qualifies as a Script Editor Essential feature? As you can see, community feedback drives what we do, so please share your ideas! We are listening. Kirk, many thanks for all your efforts with this add-on! The formatting issues encountered when copying code directly from the PowerGUI editor to the ARS editor were very frustrating! Am thankful that your support tech, CS, contacted you for this fix!